Drawing inspiration from the current 911 GT3, a Taycan GT3 would likely get active aerodynamics, including a massive race-inspired rear spoiler. Also look for center lock wheels and a wider stance with custom aero enhancements. It would be great. The battery charge would only last a few laps, but they would be great laps. Then only a few hours wait until the car charges on a domestic-rated power outlet at the race track, and back in action!. Administrator, Shark and Digs like this. Doubtful. Weissach cars exist to homologate the cars for racing. The side benefit is cars meant for tracking exist besides the Stuttgart production cars, cars never meant for public roads, although some people use them for that purpose. 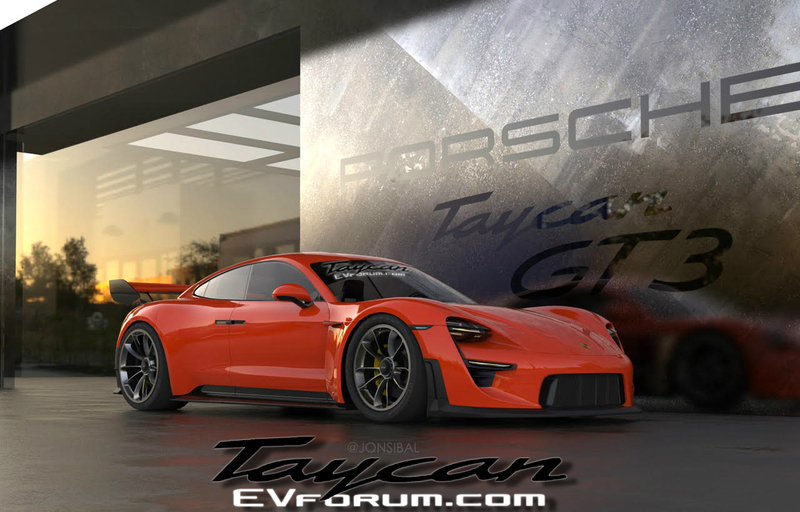 What racing series will Taycans race in? IMO, this is nothing but advocacy for electric vehicles. There needs to be a reason to build such a vehicle and I see none. Besides, the J1 platform is a prototype, stopgap, AFAIK, to get a player on the EV board. Once the mainstream vehicles go EV, it might disappear over the years. VAG knows they can't have multiple platforms. They need one platform across body types across brands. For example, the same platform for CUVs across brands or the same supercar platform across brands. Otherwise, they throw money away. Administrator and yrralis1 like this. Last edited by grim; 01-28-2019 at 03:06 PM. It’s way it is, a what-if concept that will most likely never see the light of day. But yeah, Porsche will have an EV model for the race track one day. Jaguar is already launching its own EV series based on the I-pace. Where are the rear doors - that a Taycan has? EV is the future. Might as well embrace it now! I like it. I'll take one happily. I called Porsche San Diego and right now the deposit puts me in line for late 2020 delivery of a Taycan... guess I'm late to the party. Agree. Looking forward to more EVs from Porsche. Taycan not suited for me but it appears it will be a hit. My wife has a Tesla Model S. It’s awesome. I get to drive it on weekends. How do you pronounce Taycan? Is it "Tay-Kun", like Bacon, or is it "Tay- Caan", like Macan.